Alternative names: Herniated Cervical Disc, Slipped Cervical Disc, Ruptured Cervical Disc, Herniated Disc In Neck, Herniated Cervical Intervertebral Disc. Millions of people suffer neck, shoulder, and arm pain caused by a herniated disc in the neck, known as a Herniated Cervical Disc. A herniated disc results from sudden or long-term compression loads on the spine. Herniations are more common in the lower (lumbar) region of the spine than in the upper (cervical), but can produce significant pain or disability wherever they occur. 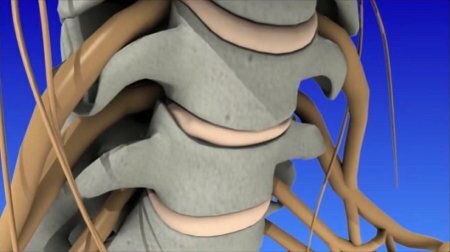 The intervertebral discs between each of the spine's vertebrae act as the spine's shock absorbers. Each disc contains a tire-like outer band that surrounds a gel-like substance. If a disc's outer band cracks or breaks open, the gel inside the disc can leak out causing a herniated disc. The disc material may place pressure on nearby nerve roots or the spinal cord, and releases chemical irritants causing nerve inflammation and pain. The human spine is made of 24 moveable bones called vertebrae. The cervical (neck) section of the spine supports the weight of your head (approximately 10 pounds) and allows you to bend your head forward and backward, from side to side, and rotate 180 degrees. There are 7 cervical vertebrae numbered top to bottom from C1 to C7. The vertebrae are separated by discs, which act as shock absorbers preventing the vertebrae from rubbing together. The outer ring of the disc is called the annulus fibrosus. It has fibrous bands that attach between the bodies of each vertebra. Each disc has a gel-filled center called the nucleus pulposus. At each disc level, a pair of spinal nerves exit from the spinal cord and branch out to specific muscles and organs. Back pain in general affects 8 of 10 people at some time in their lives. Herniated discs are most common in people in their 30s and 40s. Middle-aged and older people are slightly more at risk if they're involved in strenuous physical activity. Only about 8% of herniated discs occur in the neck region. Discs can bulge or herniate because of injury, excessive loads being placed upon them, or for no obvious reason. Aging plays an important role: as you get older, the discs dry out and become harder. The tough fibrous outer walls may weaken, and they may no longer be able to contain the gel-like nucleus in the center. Sudden stress such as from an accident can cause a cervical disc to herniate (the gel-like center ruptures out through a tear in the tough wall.) Sometimes, a disc herniation develops gradually over weeks or months. 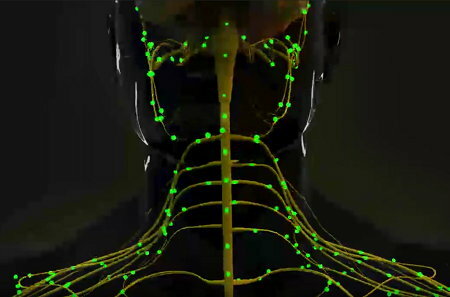 The gel material irritates the spinal nerves, causing something like a chemical irritation. The pain is a result of spinal nerve inflammation and swelling caused by the pressure of the herniated disc. Sometimes the herniation is so severe that a free fragment occurs, meaning a piece has broken completely free from the disc and is in the spinal canal. When a disc herniates and leaks its contents, the nearby section of spinal cord and exiting nerves can become irritated and compressed, causing an interruption of the normal transmission of impulses through the affected nerves. Symptoms of a herniated cervical disc vary greatly depending on the precise location (C1 to C7) of the herniation and the patient's response to pain. The pain may radiate down an arm and possibly into the hand. There may also be headaches or pain on or near the shoulder blade, and neck pain when turning the head or bending the neck. Muscle spasms (muscles tightening uncontrollably) are possible, as is numbness and tingling in the arm. There may also be muscle weakness in the biceps, triceps, and handgrip. The diagnostic process involves first discussing symptoms, their severity, and treatments already tried. A physical examination then looks for movement limitations, balance problems, and pain. The doctor will look for loss of extremity reflexes, muscle weakness, loss of sensation, or other signs of a neurological problem. Electromyography (EMG) & Nerve Conduction Velocity (NCV) testing. Often performed together, these tests measure the nerve and muscle response to electrical stimulation. While surgery was once considered almost essential for this condition, it is not as common now. Research shows that disc herniation problems may heal spontaneously without surgery or other invasive procedures. Back pain in general usually resolves by itself within 6 weeks. A positive mental attitude, regular activity, and a prompt return to work are all very important elements of recovery. Conservative nonsurgical treatment is the first step to recovery. Some 90-95% of patients improve in about 6 weeks and return to normal activity. If you don't respond to conservative treatment, your doctor may recommend surgery. Chiropractic or alternative therapies such as acupuncture. In conjunction with these treatments, healthy posture and proper body mechanics should be implemented. Surgical treatment may be recommended when symptoms progress or do not resolve with conservative treatment. Factors such as patient age, how long the problem has persisted, other medical problems, previous neck operations, and expected outcome are considered when planning surgery. An anterior cervical discectomy and fusion (ACDF) is the most common surgical procedure to treat a damaged cervical disc, the goal being to relieve nerve root or spinal cord pressure. The surgeon makes a small incision in the front of the neck. The neck muscles, vessels and nerves are moved aside to expose the bony vertebra and disc and the portion of the ruptured disc that is pressing on the nerve is removed. If the entire disc is removed, the surgeon may perform spinal instrumentation and fusion which joins two or more vertebrae. Instrumentation (i.e. screws, plates) is combined with fusion (bone graft) to stabilize the spine. Bone graft fills the void left when the disc is removed. There are different types of bone grafts, including bone graft from your body and over time the graft will fuse to the vertebra above and below to make one solid piece of bone. Artificial disc replacement can be performed during anterior discectomy instead of a fusion. 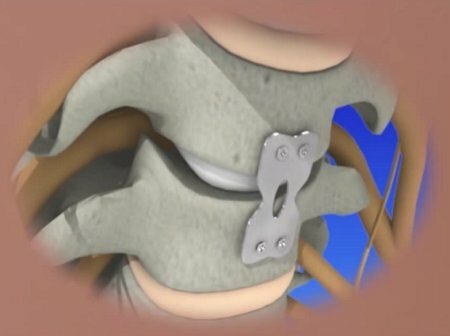 Similar to knee replacement, an artificial disc is inserted into the damaged joint space and preserves motion, whereas fusion eliminates motion. Minimally invasive microendoscopic discectomy is a procedure in which a tiny incision is made in the back of the neck. Small tubes (dilators) are used with increasing diameter to enlarge a tunnel to the vertebra. A portion of the bone is removed to expose the nerve root and disc. An endoscope is used to remove the ruptured disc. This technique causes less muscle injury than a traditional discectomy. Posterior cervical discectomy involves making a 1-2 inch incision in the back of the neck. To reach the damaged disc, the spinal muscles are cut and moved aside to expose the bony vertebra. A portion of the bone is removed to expose the nerve root and disc space. 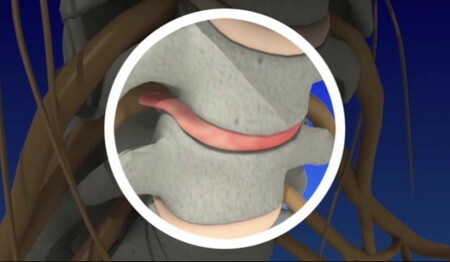 The portion of the ruptured disc that is compressing the spinal nerve is carefully removed. The spaces through which the nerve roots exit the spine are usually enlarged to prevent future pinching. Not smoking. Smoking affects circulation of blood in the small vessels that carry oxygen and nutrients to cells. The spinal discs already have little circulation, and smoking further reduces this blood flow, accelerating degenerative disc disease by drying out the discs and making them more likely to bulge and rupture. In addition, the nicotine in tobacco inhibits bone healing, so patients who undergo spinal surgery involving fusion may find that the fused vertebrae do not join together properly: healthy blood flow is essential to the formation of new bone. Left untreated, over time the herniation tends to shrink and you may experience partial or complete pain relief. In most cases, if neck and/or arm pain is going to resolve then it will do so in about 6 weeks.